Not every trip on MARTA is a solo trip. Sometimes you'll need to take a companion or two along for the ride. We have a few tips (and requirements) for riding MARTA with kids and pets. Give them a read before planning your next trip. All children 46 inches and shorter ride MARTA for free. We measure heights at all of our rail station fare gates and before boarding any of our buses. This policy is limited to two children per paying adult, and it only applies to kids 5 years old and younger. 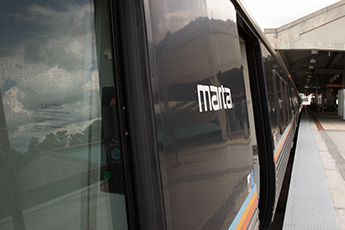 Children 6 years old or older — or children who are taller than 46 inches — will need to purchase a Breeze Card and appropriate fare before riding MARTA. Looking for some kid-friendly trip ideas? You’re in luck! Our buses, streetcars and trains are conveniently located near some great destinations for kids. The Peachtree Center and Civic Center MARTA stations are both near a few Atlanta favorites, including the Children’s Museum of Atlanta near Centennial Olympic Park Drive. The World of Coca-Cola and the Georgia Aquarium are also nearby. For more information about our fare options, check out our Fare Programs Overview page. Service animals that assist individuals with disabilities are the only animals permitted to ride unconfined on MARTA trains, streetcars and buses. However, a pet may be transported on MARTA trains, streetcars and buses, provided it is carried aboard in a secure rigid pet carrier with a lock or latch from which it cannot escape.